This phase is most of all advisable for quarreling chinchillas, which should be brought together again or by bigger groups. During this phase a close relationship should be established, the animals should built confidence to each other and become friends. The owner don't leave the animals alone and observes the behaviour of the pets well, to intervene adequately if necessary. for instance in a guinea-pig-cage - this phase is dropped, if one has chosen the guinea-pig-method for the 3. socialization method. The pets should grow up to a permanent community. Here, too, the owner is permanently present and keeps his/her eyes for at least one day and one night on the animals. The animals wchich should be socialized is given common run at a preferably neutral place. This place should be not too extensive because too much space supports huntings which can get out of control and become aggressivly and than the owner can intervene in time. Often the moment of nose-snuff-contact decides, if the pets are getting along or not. Mutual hunting and climbing is normal and part of the socialization, even if there flies a little bit fur around. Though, if one pet will be haunted permantly or even bitten, the trial must be ended and one has to think about another method of socializing which will fit better to those pets. And of course there has to be food, dustbath and water available during the session. The animals were rubbed with strong smelling substances like perfume etc. In this way the pets should react less aggressive to one another because they smell similar and hence not that strange. BUT: These fragrances irritate the respiratory tracts of the chinchillas and can cause severe allergies and indigestions. 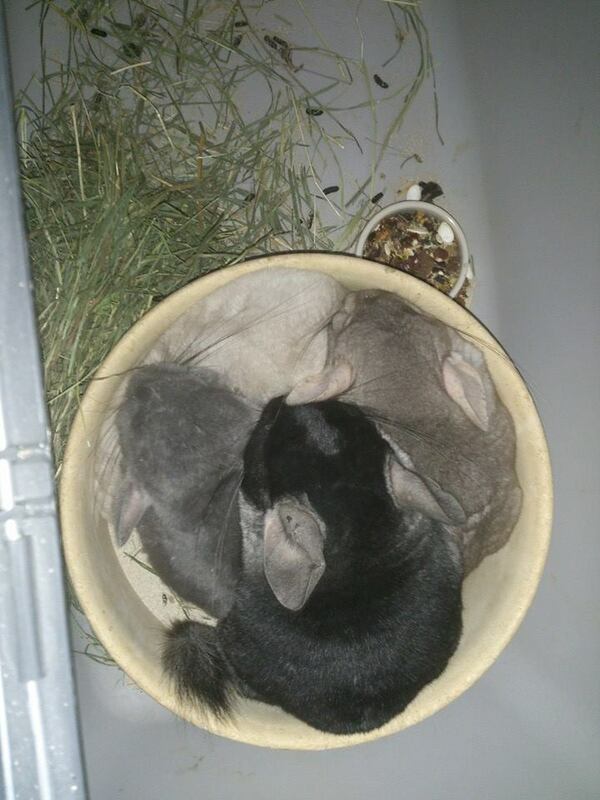 The recommended dustbath-method or cage-swap-method have btw. the same or a similar function but are preparations and no socializings per se. The slogan here is: The pets search their own partner and not the human. If one for example would like to get an individual animal a partner, he or she brings it to an animal shelter, a foster home or a breeder which has to place several pets. BUT: Please don't drive too far away because that can cause stress to the little furball what may have the result, that it reacts not in that way, as it would at home. Now you first make a snuff-test on site with the own and the chosen chin. If this proves positive, we will then let the pets run together i.e. in a guniea-pig-cage, which is unknown for both of them. If they don't get on instantly, repeat the procedure again with another chin as long, as you've found the right partner. With the cage-to-cage-method, two (or with multipe pets, multiple cages) cages will be placed next to each other, so the animals can smell, see and communicate to one another but have no physical contact. The distance has to be chosen individually: Are the chins agggressive to each other, increase the distance, are they friendly, decrease it. A neutral room should be selected so that no pet has a home advantage, as so should be the cage (don't use their main cage). This phase/ method can go for several days, even weeks depending on when the pets shows positive behaviours and make contact trough the grids (grooming, cuddling etc.). 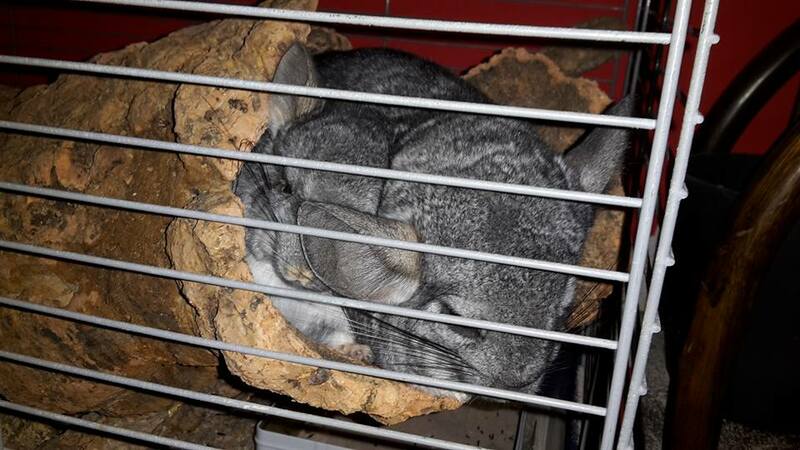 At this method, one of the pets (normally the new one) will be placed inside a small cage into the main cage of the chinchilla, with wich it should be socialized. At least two sides (for instance by placing it in the corner), better three of the small cage have to be isolated, so that it has an option for withdrawal. Unnecessary aggressions, fears and panics are created, because they can't get together to become acquainted with another or to clear up the rank order. Moreover that means, that the new one penetrates the territory ot the long-time resident, who will feel threatened - rigtly. Both of them will get a lot of stress. Bitten of paws, wounds at nose and lips can be the consequences, but also mental traumas. Only when they show no fights through the grids, a socializing at a neutral area, like a guinea-pig-cage, can be tried until both chins can move into the main-cage. Cages were swapped every week, every couple of day or daily. Chin A moves in the cage of chin B and vice versa. Optional one can only swap the dustbathes daily. 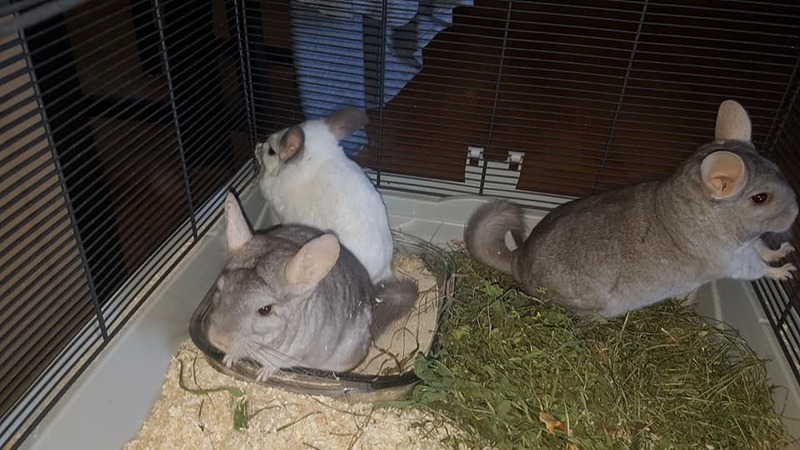 The goal of the cage-swap or dustbath swap is to let the chins become familiar with the smells of each other, so they feel no too strange during the following socializing. The cage-swap is always associated with stress. Therefore it's favorable to initially only swap the dustbathes i.e. daily for a week. Following this, the cages can be interchanged. Here the animals meet inside a roughly 100cm (40") wide cage. 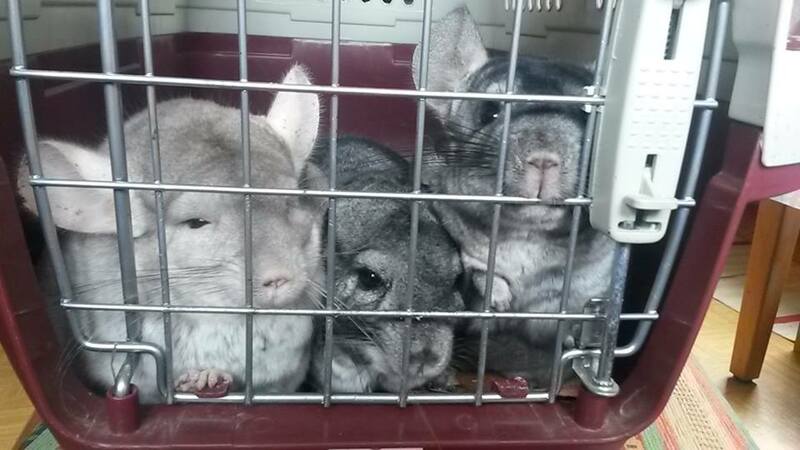 Food, water and a fresh dustbath are still waiting for the chins inside. Depending of their character, there should be placed a house or some other opportunity to hide, that can hold all animals and has 2! entrances, resp. exits. This is particularly recommended for animals displaying behavioural problems, for instance anxious or aggressive pets. The chins should stay in this cage at least 2-3 days before they move into the fresh cleaned main-cage. They have to be seperated, if they bite one another, or if one animal shows fatigue, grows more and more panic or the situation escalates instead of getting more clear. 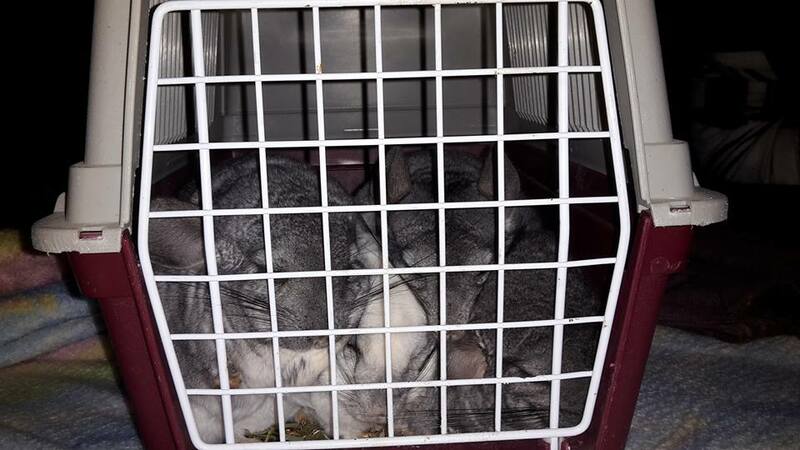 The chins will be placed in an as small as possible transport-box, in which they are unable to hunt, to climb on each other or to pee on each other. There they stay for a couple of hours up to an entire day. This method supresses during the socialization-phase the most social behaviours and the rank order cannot be clarified. The chins ally together as a result of angst and stress and, above all, because they have no choice. Afterwards the animals will be moved for at least 2 days in a preferably not too big, neutral cage, until they can move into the main cage. This "pseudo-socialization" is pure animal cruelty and must strictly be rejected. 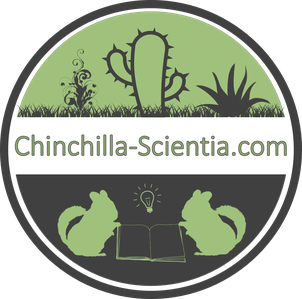 It can cause severe trauma an takes the invovled chinchillas any trust towards their conspecifics and their holder. Both animals are taken on the arms by only one person each. Now it should become to the first contact, while they are safe on the arms of there humans. They should be able to snuff at one anothers face, nose, mouth. One observes precisely what happens. There are chins who hiss to on another or even bite the other, others become fluttering and wags their tails, they make sounds, start grooming and others make simply nothing. If they show no aggresions here, this will be a good starting point for a socialization. If this test fails and if the pets shows aversions, especially beginners should think about stop the procedure at this point and search for another, maybe more suitable partner. It's a different thing though, if we have traumatized chins or those with a behavioural disorder. In this cases, even if the snuffle-test fails, the animals can be brought together however and can get a happy cohabitation. In fact there's a differnce, if the animals really fit together or if they built just a kind of community of purpose, what is easily fragile and can bring further problems. For starters, the snuffle-test should be more a kind of a guideline or one takes help from people with more experiences in socialization. 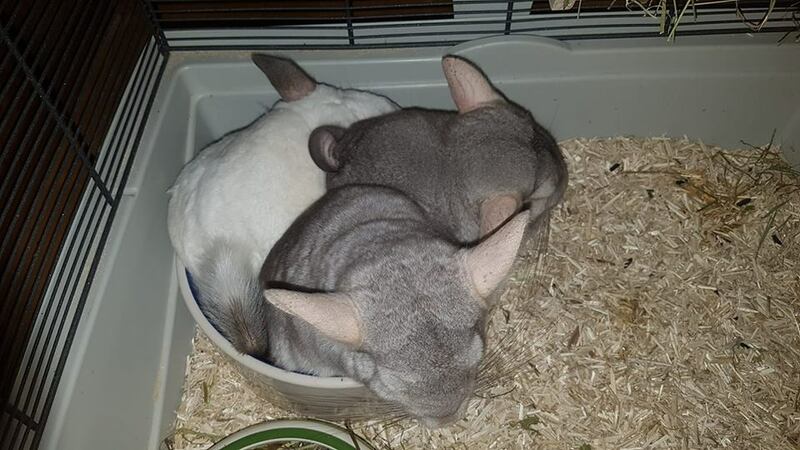 The chinchillas are put in a transport-box, for instance a cat-transport-box, in which is already placed a dustbath (that's important for decrease of stress and it's a popular "meeting place"). The boxv shlould be big enough to give the pets place to move around and should give enough place for food and dustbath. Depending on the respective progress, the chins stay there for a couple of hours up to a maximum of 24 hours. They have to be seperated, if they bite one another, or if one animal shows fatigue, grows more and more panic or the situation escalates instead of getting more clear.